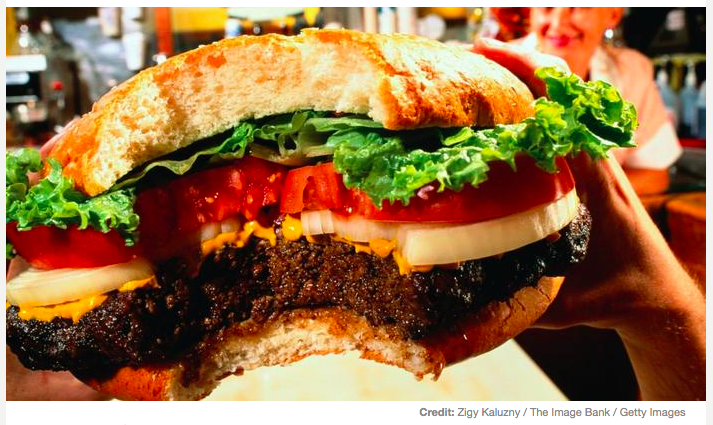 BEFORE YOU DIG IN…Why the monstrous hamburger? This post was originally a 5-minute presentation I delivered at #GetFed, an #EDVent in Vancouver hosted by @gabrielpillay1 (and his wonder-team) that had a “food” and “dining” theme. My topic: “Practices that feed the mind and nourish the imagination.” And so I chose to focus on a hamburger. My writing style is a bit unconventional…My aim was to walk the walk—I wanted my audience of educators to actually feel the imaginative tugs and the emotional responses that all human beings experience when cognitive tools are employed in learning. I’m curious about what kind of impact the post will have on those reading it–as opposed to those in the audience. So please read on and please leave me a comment! This is the 2/3 lb Monster ThickBurger from Hardees. What are you hungry to know about it? At first glance you might be curious how many calories this monster burger contains. Well, I can tell you that this is actually the highest calorie fast-food hamburger on the market boasting a staggering 1,290 calories and a meager 92 grams of fat. It looks awfully big doesn’t it? You may be wondering if this is the BIGGEST hamburger? It is not. The world-record for the largest hamburger ever made goes to a burger made in Carlton, Minnesota, in 2012. That hamburger weighed over 2,014 lbs. and had over 50 lbs. each of tomatoes and lettuce, 60 lbs. of onion, and 40 lbs. of cheese on it. Maybe you are hungry to know what this thing costs? Well, it is certainly not the most expensive hamburger. Enter: the “Glamburger” which will cost you $1,768. This kick to your wallet contains black truffle and a Kobe Wagyu beef patty from Japan, some Iranian saffron, beluga caviar, Canadian lobster, gold leaf, black truffle brie, New Zealand venison, and some white truffle to top it off. You may be craving the story of what happens in (or to) your body when you eat something like this. I could pull a Ms. Frizzel and take you into the human mouth. Together we could experience first-hand the sudden inundation of saliva (we may nearly drown) as the body prepares to breakdown the food. Or we might move into bloodstream and observe in detail the process whereby food calorie energy is broken down into basic units like glucose by the cell mitochondria. A day in the life of a cell mitochondria would be pretty fascinating change of pace. You might be hungry to know who would eat one of these? Well, Joey Chestnut would have at least one. He is currently the world record-holder for hamburger-eating. He managed to throw back a gut-busting 108 hamburgers in 8 minutes to win that title. Perhaps you are hungry for the history on the hamburger, you would be satisfied with more knowledge of how this culinary beast came to be. I discovered that hamburgers have a long and international history. For example, there is evidence that in the 12th-13th century Genghis Khan and his army ate “early” burgers. Genghis Khan and his army stayed in their saddles for long periods of time, sometimes days without ever dismounting. They had little opportunity to stop let alone build a fire to cook their meals. They would take scrapings of lamb or mutton and form them into flat patties. They would then “tenderize” the meat by placing it under the saddles of their horses while riding into battle. When it was time to eat—at least hours and possibly days later–the meat would be eaten raw, having been tenderized by the saddle and the back of the horse. Perhaps you find this image grotesque—it really revolts you? You might be feeling that tension between what is healthy/unhealthy? Or perhaps you feel an unsettling—even disturbing–sense of gluttony as represented here and the reality that many people in our world are starving. 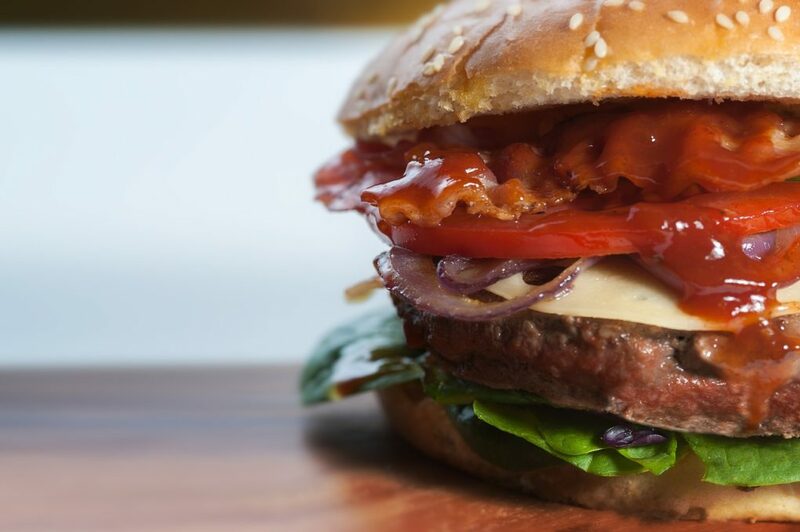 You might taste—on a philosophical level—what this burger says about global inequities that exist. You might even feel a sense of idealism. You might feed now on theories and ethical/personal standpoints behind carnivorism, vegetarianism, vs. veganism. Ethically what statement this burger makes about animal rights? Nutritionally what concerns does this image evoke for you around health and wellness? Environmentally, the ecological impacts of meat production have been well documented including pollution through fossil fuel usage, animal methane, effluent waste, through to water and land consumption. So, educators, to the question of how to “feed the mind and nourish the imaginations” of our students. We must always acknowledge that our students enter our classrooms hungry for knowledge. Humans beings love to learn. Indeed, learners of all ages have active emotional and imaginative lives that are stimulated and captivated by different aspects of the world. My aim tonight was to have you experience the different dimensions of the imagination. These features of imagination that evoked your imaginations and emotions tonight are not “hooks” for learning—they are actually powerful tools at the heart of all meaning-making. They are tools for making knowledge memorable. The question is, do you know what your students are hungry for? Let’s replace “burgers” with biomes, or fractions, or photosynthesis, or pronouns or punctuation, or algebra, or allegory, or [INSERT SOMETHING YOU TEACH HERE.]? Use the right cognitive tools and you can feed your students’ minds and hearts. FEED your students extreme, odd, bizarre information about the topics you teach. FEED them the human dimensions, the history and—no matter the topic—a “story-form” which leaves them emotionally engaged (Not creating fictions!). FEED their emotions with vivid images that call on the sense and engage the body in learning. FEED philosophical thinkers with generalizations and theories that offer a sense of “Truth” and then unsettle them with anomalies that require more knowledge, critical and creative thinking. I hope you will join me and “imagine education”—imaginED—that leaves students inspired—hungry for more learning. So did the post evoke your emotions and/or imagination? Did you experience the power of the cognitive tools I employed? I am thinking of using this 5-minute presentation in my workshops to introduce Imaginative Education… Crazy idea? Good idea? Given the choices, I’m going with: good idea. Your writing vividly demonstrates the cognitive tools. I also liked how it was clearly organized, yet in an engaging way that didn’t resort to a predictable essay framework. Thanks very much Brian. Your comments mean a lot to me. And your honesty! Sometimes I need saved…from myself. But it sounds like this has the desired effect and could be a useful way to provide some experiential support to the PD I do. Gracias! I really enjoyed it! I don’t like meat very much, but I really wanted to eat a burger, then my opposites thoughts started to fight…after that I became philosophic and thought about the documentary of National Geographic about Global Warming…and then about the Netflix Documentary “Cowspiracy”….great job! Honestly! You really show us how to use cognitive tools to engage ourselves…no matter what the topic is. Gillian, I’m going to say it’s a crazy good idea!! I was drawn into the flow of your writing, very story like. Very descriptive. I was able to make a visuals as I was reading. Kudos!! Thanks for reading it–sometimes I need to save myself from…myself! Sounds like this is something I should do in the future. Appreciate your honesty!